Starting off the day on a positive note is an important part of any elementary school classroom, and the Morning Meeting Greeting can be a crucial part of setting that tone. But finding the right greeting for your class can be a challenge, as can keeping enough variety in your greetings so that your students don’t get bored. Fear not—we have seven fun ideas for Morning Meeting Greetings that you can try in your classroom. 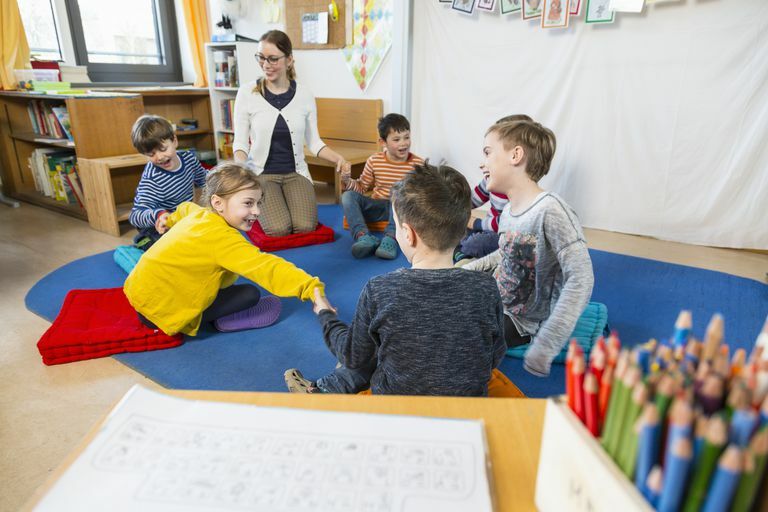 Finding an activity that engages students in greeting each other and gets them moving can be a challenge, especially when you’re trying not to get them too excited and silly. The Tangled Web greeting is a simple but engaging activity that can be done either sitting still or moving around! Start by having your class sit in a circle. Give the first student a ball of string or yarn and have her hold onto the loose end and roll the ball to another student. You can also gently toss the ball if it’s not perfectly round, but that may result in rogue balls of yarn flying away and lots of silliness! Encourage the students to remember who sent the ball of yarn to them; this will help later on. The person who sent the yarn greets the person who received it, and the receiver thanks the sender for the yarn and says good morning as well. The student who received the ball then firmly holds onto the string before rolling or tossing it to another student to repeat the process. Remind the students not to simply hand it to their neighbors, as that won’t create the web. Make sure the last person to receive the ball of yarn is the teacher. Once every student has a line of yarn in his or her hand, now it’s time to undo it! One option is to have the students all stand now, and start with the first student who will run underneath the web to the person she initially threw the ball to and gives her yarn to the student. That student will then take all the yarn and run underneath the web to the person he threw it to and gives his yarn to that student. This continues until the web is gone, everyone is in a new spot, and the teacher has a giant mass of yarn in her hand. The other option to undo the web you wove is to have the teacher, who is the last person to receive the yarn, reverse the process and roll or toss the yarn back to the person who originally sent it over. Students stay in place this way, and ideally, the ball of yarn will get re-wound as it goes back to the students in reverse. This Morning Meeting Greeting combines math and greetings into one! The teacher will prepare a number of flashcards for this activity: one set will have math problems on them and the other set will have the answers. Mix up the cards and have students each choose one. They then have to find the student who holds the match to solve the problem and greet each other! This greeting is a great one to grow with throughout the year. Students can start super simple, and as they advance in their studies of math, the problems can get harder to solve. Like Find a Friend, this can be a great greeting to help students get to know each other at the beginning of the school year. The Hidden Treasure greeting is a perfect way to have students get to know their new friends by having them interact with several students. To do this, they exchange greetings for the day by shaking hands and saying hello to multiple new friends. The Hidden Treasure comes into play, however, when the teacher chooses one student to hide the treasure (a penny works well) in the hand that she is not using to shake hands. Everyone tries to guess who has the hidden treasure by asking one question of the person they have greeted to try and determine if that person holds the treasure. The treasure holder shouldn’t reveal the truth right away and should play along pretending she does not have the treasure. Students can’t outright ask if the hand shaker has the treasure, but creative sleuths might be able to figure it out. However, the truth won’t be revealed until the treasure owner shakes at least five or more students’ hands! This activity is also a great way to help students build social skills. This one can be a lot of fun and gets students moving around, but it will take a little longer to complete. To do this greeting, the teacher will need to buy two of the same puzzle so that the pieces are identical. The goal is to get students to assemble the puzzle using only the pieces they can match to another student; this is when they will greet a peer. Students should be divided into two teams, one assigned to each puzzle set that will be completed. A simple puzzle with 40 pieces or fewer is usually best for this activity, but as the students get older, you may wish to make this a bigger challenge by throwing in a few rogue puzzle pieces into the mix (step 2) or finding a larger puzzle. If you're going to add rogue puzzle pieces in, choosing pieces of a different size and color can be a simple way to increase the challenge. The teacher will set up an area where students will assemble the final puzzles. If the puzzles are larger or the class may need some help, the teacher may wish to begin assembling the puzzle and simply have students fill in the missing pieces. Divide the classroom into teams; each team must build or complete a puzzle. The teacher will mix up the pieces for each puzzle, keeping each puzzle in a separate spot. Students from each team will select one or two puzzle pieces from the piles of mixed up tiles (the goal is to have all pieces in the hands of students at once so everyone is guaranteed a match), and then head out to find their match. This can be tricky as some puzzle pieces will be the same shape, but not have the same image on them! Each time a student thinks they have found a match, they greet the other student and then confirm they have a match before delivering the piece to the puzzle frame. As students find matches and make greetings, they can start to assemble the puzzle and should also greet anyone else who is at the puzzle station working to assemble. This greeting is perfect for groggy mornings when everyone is looking a little sleepy. Simply grab some of the scrap paper in your classroom and write each student's name on a sheet, then hand it to the child. If you like, the students can write their own names on the sheets—preparing for this greeting can even be part of a planned writing activity the day before. They get to crumple up the paper into a ball (the snowball), and when you say go, they get to have a snowball fight! But first, make sure you set up some classroom ground rules so things don't get chaotic. You may want to specify no running or leaving your line (see the example coming next), and when the teacher says "FREEZE!" the throwing must stop. For example, to keep things somewhat organized during this activity, you might have students stand in one place for the activity, rather than run around. Arranging them in two parallel lines can be a great way to keep them from going crazy and keep them spaced apart once you say, "GO!" Use painter's tape on the ground to show where they should stand, and you might suggest that one foot must stay in the box at all times, to keep them from diving into the middle of the lines to grab snowballs! Once you give the go-ahead, they get to toss their snowballs at the opposite line, and can even grab snowballs within their reach after they've been thrown. Give them as long as you want to laugh and have fun, but this exercise could be as quick as 15-30 seconds. Once you call "FREEZE!" the students grab the snowball nearest them, undo the ball, and greet the person whose name is on the paper. Any kind of activity that lets students gently toss something to another person is likely going to be a hit. Grab a koosh ball, or another similar soft and squishy ball (finding a ball with the fringe bits make it much easier to catch than using a regular round ball), and then organize your class so they are either sitting or standing in a circle. The teacher can start by greeting a student in the circle and then gently tossing the ball to him or her, modeling what a gentle throw looks like. The person who receives the ball will greet the person who tossed it, and then greet someone else and toss it to him or her. It's always helpful to say the greeting first, which aids in students paying attention and being prepared to receive the ball. If you don't have a koosh ball or are worried that your students will get a little carried away throwing a ball, you can always you a soft bouncy ball or beach ball and have students sit on the ground and roll it to each other.